Today is the first day of fall. Though we’re still surfing on the remnants of the beautiful summer we’ve just had, the leaves will soon start to turn yellow, then orange and finally, red. It’s quite the show, really, and because it lasts a while over a vast territory, you’ll have plenty of time to enjoy the spectacle. 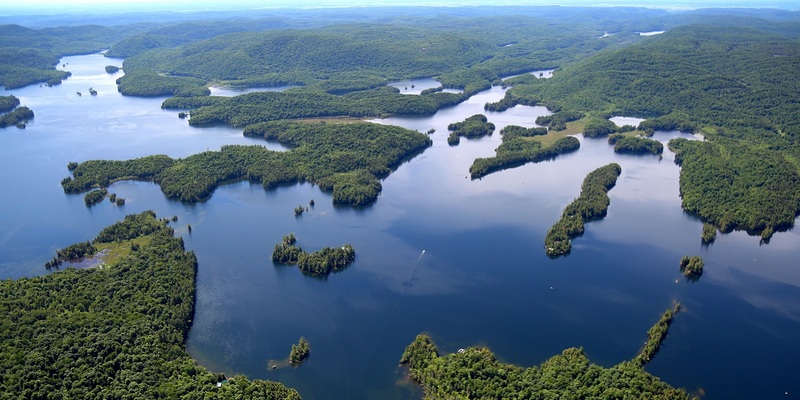 The Outaouais is big; put yourselves in contemplative mode and be seduced! It makes perfect sense that a site so important in the region’s lumber industry would make the list; after all, it means trees galore (though must of the timber came from conifers but hey! Who’s counting?) 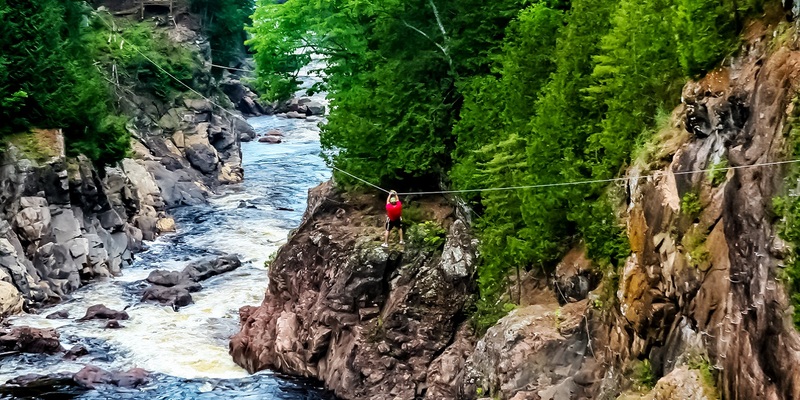 Apart from the aerial park, the via ferrata and the giant ziplines, the Chutes Coulonge Park has a nice trail to take show through the beautiful forest while telling you about the lumber industry’s golden days and the Bryson dynasty. Leslie Park is a beautiful campground in the summer, complete with a very inviting beach, but it also has a 4km trail along Moore lake that you can walk or cycle on to enjoy the fall foliage. Neighbouring Castor Géant trail is perfect for mountain bikers looking to add a little adrenaline to their sightseeing. Here you’ll find 13km of trails over 589 hectares of beautiful forest. An observation tower from which you can observe twelve lakes (including majestic Blue Sea lake), a heated refuge along the way and an old fire-tower will ake you enjoy the decor even more. Ok, the decor doesn,t really need the help but still; all the more for you to enjoy! Another observation tower can be found in the Vallée, this time at Mont Cayamant. To get there, you’ll walk through forest and marshes on superb trails that’ll really make you appreciate your surroundings. And the view from the top of the tower? Simply breathtaking, with many lakes and hills to be seen. 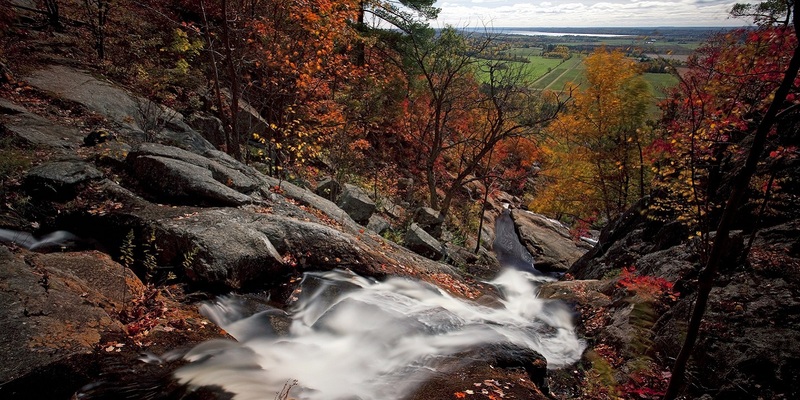 Gatineau Park is THE best to observe the colours changing, being that the park is so big and varied. You have many experiences to choose from so we’ll only name a few here. Treat yourself to a nice restaurant or café in Chelsea after your hike. This trail is a bit more than 8km long and it’s absolutely not for beginners! It starts at Blanchet Beach on Meech Lake and it makes its way up into the hills, all the way to the Eardley Escarpment, from where you’ll have quite the view on the valley below after a good trek through changing scenery. Don’t worry; all the goes up must come down and your way back will prove easier. Here, loitering and leaving the trail are allowed. A autumn picture amongst the ruins of the Abbey or in front of the Residence ill no doubt be hits on Instagram! Of course there are trails you can walk on but it’s just as fun to lay on the grass and gaze at the orange foliage all around you. As we said, the park is huge and makes for many differents adventures. 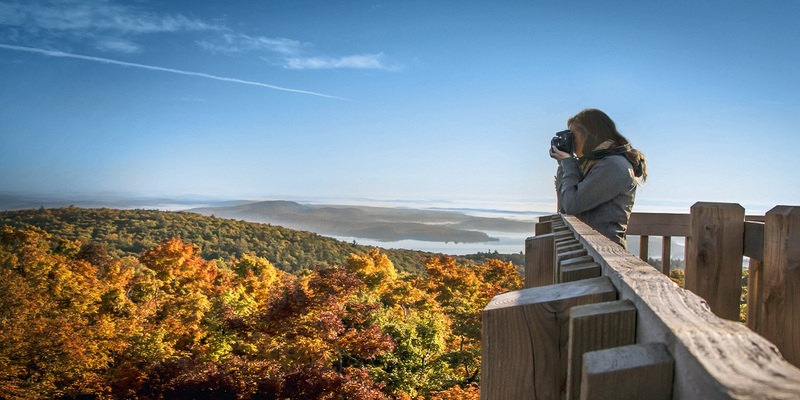 Here’s what the NCC has to offer you to fully enjoy the Fall Rhapsody. One of the oldest forests in Eastern North America, it offers you six trails with evocative names like “la prucheraie” (hemlock spruce plantation) or “le ouaouaron” (bullfrog), my personal favorite. Many lakes (including Lake la Blanche)can be seen depending on the trail you take. This forest has remained practically untouched for centuries! Kenauk Nature offers many activities but the sheer size of this magnificent reserve guarantees you’ll be exploring for a while. Bearing close to sixty lakes, nature isn’t done revealing itself to you. Parc des montagnes Noires de Ripon promises a rich hike in the mountains. From the lookout at the top, you can see all the way to Mont-Tremblant on a clear day so that says a lot about your view of the immediate surroundings. If you don’t feel like walking too much, you can almost reach the top with your car. Of course, there are many other places where the colopurs will take your breath away. We can’t mention them all ’cause we’d have to publish anhj encyclopedia! Go explore! Take pictures! When you share them on social media, be sur to tag them #outaouaisfun and who knows? We just might share it!